Jump ring, 14Kt gold-filled, 6mm round, 4.2mm inside diameter, 18 gauge. Sold per pkg of 20. Item Number: H20-1945FD Have a question about this item? Jump ring, anodized aluminum, gold, 6mm round, 4.2mm inside diameter, 18 gauge. Sold per pkg of 100. Jump ring, anodized aluminum, gold, 6mm matte round, 4.2mm inside diameter, 18 gauge. Sold per pkg of 100. 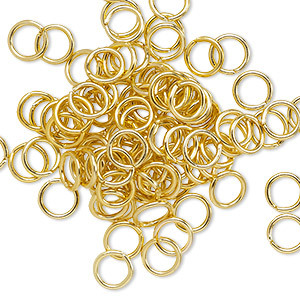 Jump ring, 14Kt gold-filled, 6mm round, 4.4mm inside diameter, 20 gauge. Sold per pkg of 20. 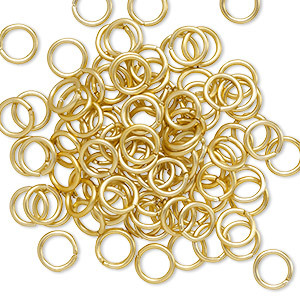 Jump ring, 14Kt gold-filled, 6mm round, 4.3mm inside diameter, 19 gauge. Sold per pkg of 20. Jump ring, 14Kt gold-filled, 7mm round, 5.1mm inside diameter, 18 gauge. Sold per pkg of 20. Jump ring, 14Kt gold-filled, 6mm round, 4.7mm inside diameter, 22 gauge. Sold per pkg of 20.